Orgcon14 was opened by its keynote speaker, Correy Doctrow, one of the UK’s leading digital liberty campaigners. This presentation was a bit of a reprise although he concludes by addressing recent developments in the politics of surveillance in the UK. Perhaps I should get in on this, although since I can’t sing or play an instrument it might be a bit hard and it’s no longer the ‘70’s; I think I missed my chance. Fame doesn’t make you rich, but you won’t make money if you’ve not been heard of. Doctorow referred to the Hachette vs. Amazon case which Amazon are looking to use their locked–in and proprietary format and distribution platform as leverage with Hachette one of the largest publishers books. In this case it would seem that the interests of the consumers and authors are not foremost in the mind of these two corporate behemoths. The point is that the Amazon’s DRM solution is a key part of the power and so-called value of the Amazon’s platform. It’s an extraordinary story because the power of the two antagonists are near equal. The behaviour towards in the case of Amazon their customers and Hachette, their suppliers, is hardly exemplary. They are both colluding against self-publication, which is becoming economically viable which takes us to the 2nd law. Furthermore we are now in a position where the breaking of DRM is a worldwide crime, but it’s the second crime, because copyright infringement is the first. Business and public people can’t hide from pursuit. In the case of business, they are safest if they commission their content and acquire it as a transferred work artefact. This seems to me as a very similar business model to a protection racket. The uncertainty that businesses have is an inhibitor to using non-established players. Google’s “Content-ID” also acts as barrier to entry, and the need for it is caused by the copyright laws, although Google have ensured the toast lands butter side down and anyone seeking to compete with them needs to have a similar capability. These law are the results of lobbyist’s influence. The problem for most creators is not piracy, it’s obscurity! This is exacerbated by the industrial concentration, there are 5 labels, four publishers & four studios which dominate their businesses and they abuse their market power. The example Doctorow gave is that music companies still charge breakage. 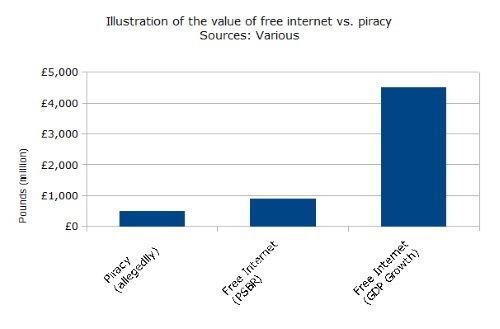 The fact is that the whole anti-piracy infrastructure is an inhibitor to economic confirmation. It’s also the reason why the only artists that support copyright maximalism are those with royalty contracts and it would seem members of the musician’s union. In looking at whether information wants to be free or not, Doctorow’s problem is anthropomorphism. It’s people that want to be free and today it can’t be done without the internet. It’s the nervous system of the 21st century and it’s being regulated as if it were a video-on-demand system. To me this is a great summary and explains why copyright enforcement is in conflict with the fundamental rights of freedom of expression and privacy. Doctorow made his penultimate point that we need to know about the software we use and made the point that DRM only works if you criminalise the breaking of the digital locks. This is the first step to the criminalisation of civil security research and the underwriting of the principle that software does what someone else wants, not what its customers want. This is a point he makes at length in his speech “The coming war on general purpose computing”. We are approaching the “I can’t do that Dave” moment, at least we have the laws that permit this to happen. He mentioned the growth of legislatively backed graduated responses, and cited the UK’s Digital Economy Act, but not the failure to implement it nor the failure of HADOPI and the coming privatisation of these schemes. The transfer of duties from a legislatively prescribed processes with defined rights of defence to so called voluntary schemes which are excluding judges and rights of defence is something to be opposed. He also misrepresented the nature of the DE Act. Disconnection was written out of the potential punishments, this was because the government and the entertainment industries wanted an industrial (i.e. cheap and repetitive) punitive process for which the British courts are currently unused. The free internet numbers come from the PWC report, the piracy numbers come from speeches made at Labour Party Conference and submitted in evidence to various government and judicial bodies, most notably the judicial review of the DE Act which reviewed multiple evidence submissions, the BPI number is the highest. The review judgement is posted here, the multiple research projects are categorised in § 252. Doctorow finished by repeating a theme he’d visited several times in the speech. The firms pursuing these activities are not evil, nor (necessarily) run by evil persons, but it’s the banal cult of fiduciary duty, it’s the result of capitalism and that’s the end of the road for liberals! To go further you need an anti-capitalist analysis. This speech wasn’t one of his best, but it all bears repeating although intellectually I think we have won the economic arguments we need to move on to the moral ones now. The featured image is @flickr by sunnyUK, CC BY-NC-ND 2008.